Nicea’s Yogurt Pancakes with Homemade Syrup are the best pancakes ever! The yogurt in the pancakes and in the syrup gives both a rich texture and flavor. My sister-in-law, Nicea, made these for me the last time I went to visit her. They are probably the best pancakes I have ever had. Normally, I am not the biggest pancake fan, but I could eat these yogurt pancakes all day. YUM! You definitely need to try these! They are soft and fluffy, yet perfectly dense. After you see how easy (and DELICIOUS) these yogurt pancakes are, you will never go back to making pancakes from a mix again. 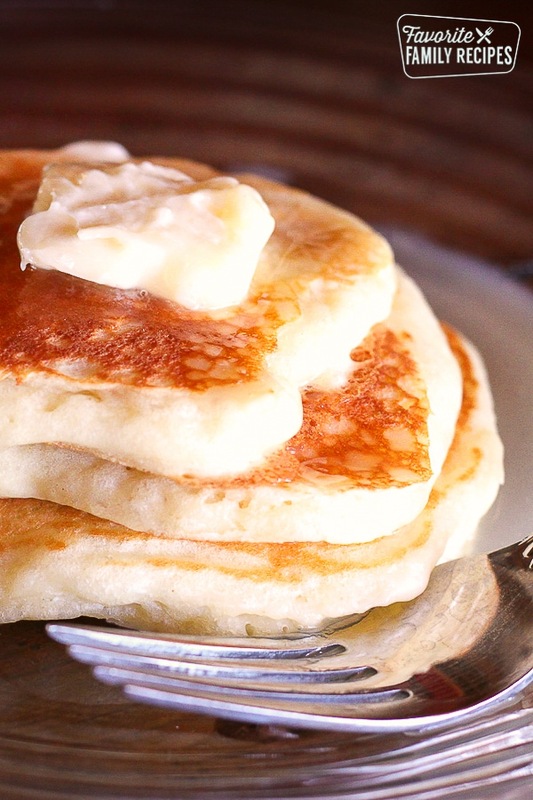 The pancakes on their own are amazing but the syrup… the syrup is liquid heaven. It is smooth, slightly creamy, and perfectly sweet. I really could probably drink it through a straw. I promise, you will not be disappointed. It is SO GOOD. Try it on waffles, French toast, crepes.. even ice cream! Nicea's Yogurt Pancakes with Homemade Syrup are the best pancakes ever! The yogurt in the pancakes and in the syrup gives both a rich texture and flavor. Mix all ingredients. If it seems too thick, add milk a little at a time until it reaches a good "pancake batter" consistency. Need more breakfast ideas? Give these a try too! Breakfast Monte Cristos: This is a delicious cross between French toast and Monte Cristo Sandwiches. A great breakfast for a crowd. Try dipping them in the syrup above! Crock Pot Breakfast Casserole:This Crock Pot Breakfast Casserole is perfect when you have overnight company. Throw it in the slow cooker at night and breakfast is ready in the morning! Grab and Go Breakfast Parfaits:Grab and Go Make Ahead Breakfast Parfaits are a quick, healthy breakfast for busy mornings. Yogurt, granola, and fruit will start your day off right. Light Freezer Breakfast Sandwiches: These Light Freezer Breakfast sandwiches are perfect for mornings on the go. You can make 24 at once, freeze them, and pull them out one at a time to heat in the microwave! Need even MORE breakfast ideas? Here is a list of over 30 of our favorites! I can't wait to try this pancake recipe! I'm constantly searching for a fluffy pancake recipe that is good. That sounds like it wouldn't be hard to do…but it really is. I receive your emails and love your blog! Thanks for sharing this recipe. ??????????????? ?Thank you for the reciepe! Yum! I am excited to try something other than the blan bisquick pancakes. Thanks for the recipe! So, I am on you blog this morning looking up the Nothing Bundt Cake recipe, AGAIN. It is my favorite cake, but I want MORE! I was just in Nothing Bundt Cake the other day and sampled the raspberry white chocolate…it was to die for. I also LOVE their red velvet cake. PLEASE make some more! I want those recipes so badly, and I know you are the one who can figure it out for me. Thanks for all the great recipes. The pancakes looked so yummy,I am defiantly making this for breakfast. I just made these pancakes and they are super good.Thanks for sharing. Did you adjust the baking soda or powder amounts? It sounds like it might taste too salty. I’ve made this recipe several times, and it’s not too salty with these amounts. Thanks for asking! Thanks for this recipe, it is delicious! I have to say it is now one of my favorite pancake recipes. I have made a couple of changes though that I thought I would share. The dough is very thick, so I always add some milk to the batter (about 1/2-3/4 c.). I also use 1/2 sour cream and 1/2 yogurt in the batter and it works out perfectly. I have even used vanilla yogurt and it is even better! For the syrup I also have tried vanilla and strawberry yogurt and it is amazing. We serve these pancakes with fresh berries on top and the strawberry syrup and they are like heaven on a plate. Thanks again for sharing!!! We enjoyed these pancakes for dinner tonight and my husband declared them to be the best pancakes he has ever eaten (better than Alton Brown’s!). Funny thing is he turned his nose up while I was making the syrup and said he wouldn’t eat any of it. As soon as he saw it and tasted just a drop he changes his mind. He went back for seconds. Yum. All the kids enjoyed them too…these are our new house pancake. Thanks so much for sharing. You probably need to add a little more flour so the batter isn’t as runny. Depending on where you are elevation-wise it can turn out not as thick. Every time I make this, the batter is pretty thick! Haven’t done it with Greek yogurt but I am sure it would be ok! Can you come up with any substitutes for the sugar, butter and corn syrup for those looking for healthier alternatives ? Thanks! Made these this morning and they are AMAZING!! Not to salty, just perfect. Thank you for sharing this recipe! Hi. Just tried both the pancake and syrup for breakfast today. Thumbs up for the recipe! Anyone know how long can I keep the syrup? It should keep in the fridge for a couple of weeks. I am excited to try these. I do weight watchers and I count points. Do you have any idea how many points they would be? We don’t have that information on hand. You can plug the recipe into the WW recipe calculator and it should be able to tell you. Hope this helps! I love melt-in-your-mouth pancakes and when I stumbled across this recipe, my life-long search for the perfect recipe is now complete. Then when I thought it couldn’t get better, I made the syrup. Now I can die a happy man! We have made this recipe for many visiting family, including some cousins that are living in Saudi Arabia for work. Now their Saudi friends are enjoying it. Thank you. I made this today for breakfast, it was the best pancake breakfast ever! I used greek yogurt and and the batter was really thick so I added some milk and it was perfect and fluffy, so decadent! And that syrup!